On February 24th, also known as Pink Shirt Day, everything looked rosy at The Flag Shop. From coast to coast, Flag Shop employees slipped on their pink shirts and lined up for selfies. Anti-Bullying movements are a big deal to us here so we like to do what we can to support the initiatives that come our way. Most recently we launched a school fundraising program that enables schools to spread the Anti-Bullying message while raising money for school initiatives. In the pink shirt photos below, you may even steal a peek of some of the anti-bullying products we carry. Now without further ado, the parade of pink shirts! Last but not least, the The Flag Shop Head Office staff posed outside for a photo. There were lots of cars driving buy, so hopefully we served as a human billboard for the message. HAPPY PINK SHIRT DAY EVERYONE! Pink Shirt Day isn’t the only day that promotes the Anti-Bullying movement; next up is Day of Pink on April 13th and the United Nations Anti-Bulling Day on May 4th. For more information on Anti-Bullying initiatives and to learn more about our school fundraising program, visit www.antibullyingflag.ca. Is it the United Nations? No, it’s the inclusive cafeteria at Evergreen Park Elementary School. For Evergreen Park Elementary in Moncton, N.B. flags go hand in in hand with every new school year. As New Brunswick becomes more culturally diverse, so do its students, and this school has found a great way to make new students feel welcome. 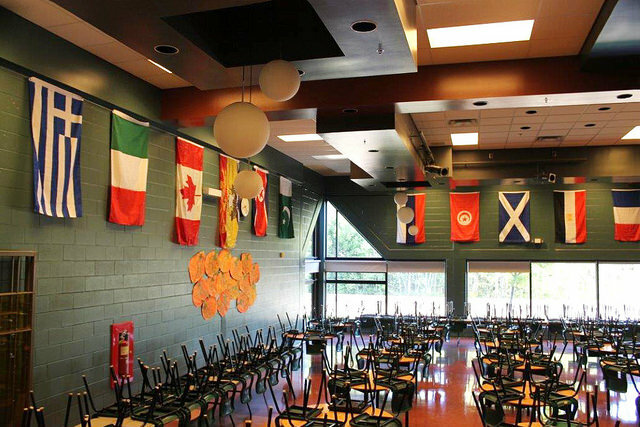 Adorning the walls of their cafeteria are flags of the world. Every flag represents a student or students that attend Evergreen and whose cultural heritage lies in another country. These flags serve to create a friendly environment for students and to remind everyone that Evergreen is an inclusive place that supports the ideals of multi-culturalism. The flags serve this initiative by visually accentuating the differences in culture while at the same time encouraging equality through hanging equally sized flags at equal heights in the same shared space. They also help to beautify a public space in the school, making it a more desirable community environment. World flag collections are a great way to celebrate diversity in your community. To start your own international flag collection, visit the World Flag section of our online store. UPDATE: The school has been featured by Global News!